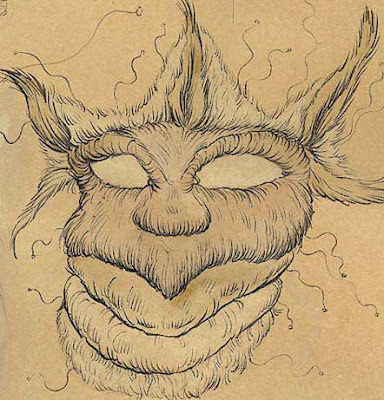 The above three drawings were taken from a series titled "Facing the Sublime & the Grotesque" concerning monsters and myths. 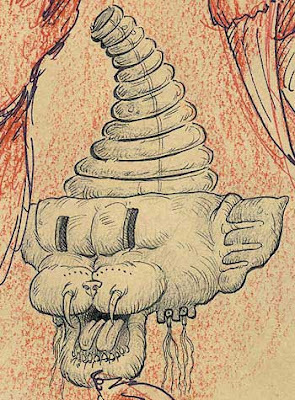 The drawings have a great stylistic balance between the works of Philip Guston and Dr Seuss. 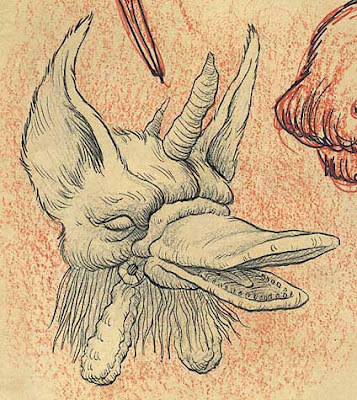 The following quote from the artist best describes the artwork on the site, "Stylistically the work marries the pop-surreal with visionary art, appropriating environments from sequential art, illustration, desktop publishing and animation as well as the traditional structures of painting, printmaking and the illuminated manuscript. " Here is one of my favorite paintings from the site. These are awesome sketches, thanks for posting! The linework is beautiful, and the construction is wonderfully inventive.